Hi my name is Paramjeet Kumar Dubey, I secured AIR-3 in GATE 2019. For the preparation of GATE and ESE, I came to Delhi and enrolled at IES Master in its Regular Classroom program. The faculty members at IES Master are very supportive, helpful and friendly. The study material of IES Master is the best among all other institutes. I suggest that every student should study these materials for their preparation of GATE and ESE. Take us through those joyous moments when you got to know about your result. When I came to know that I secured AIR-3 in GATE 2019 from Civil Engineering, I took the blessing of my father and mother, and thanked God for helping me achieve success. What was your score in GATE 2019? What do you think actually worked for you in GATE 2019? Practice and revision as well as positive mindset – that I will not commit any error in the exam – helped me a lot in securing this good rank. How did you develop the positive attitude and that ‘eye for detail’? The test series of IES Master that I took helped me in time management and making my solutions error-free. 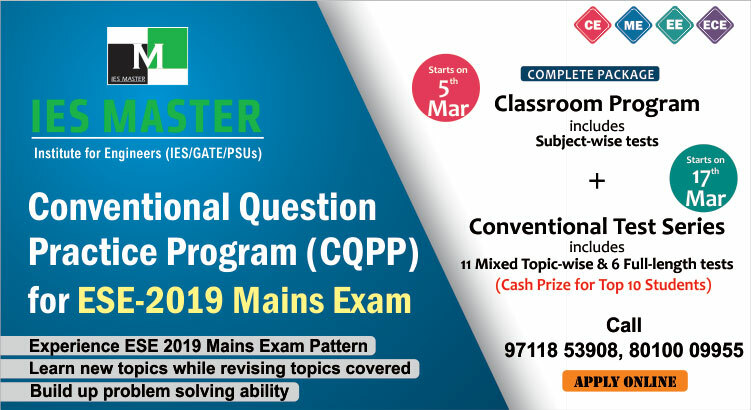 Tell us about your journey from NIT Patna to IES Master. During campus placement at NIT Patna, I got placement at LNTECC. I went there, and worked for seven months, and then I came to Delhi. I came to know that IES Master is one of the renowned institutes for GATE and ESE preparation. So I came here and joined IES Master. Which program were you a part of here at IES Master? I was a part of Regular Classroom program here at IES Master. Give us a feel of the environment of the classroom at IES Master? The environment was quite friendly. The teachers were quite friendly, supportive and helpful to the students. They used to clear the doubts then and there in the classroom itself. How did you perform in IES Master test series? My performance in IES Master test series was not very good. But I used to bookmark those questions that I could not solve, and I used to go through those questions during free time. One week before the exam also, I practiced the bookmarked questions. How did you remain motivated during your preparation? As I am from Sainik School Nalanda, where we are prepared for NDA, most of my friends are in Indian Army as officers. I also wanted to become a Class-1 officer. When I came to NIT Patna, I saw that most of my seniors were employed in good PSUs. 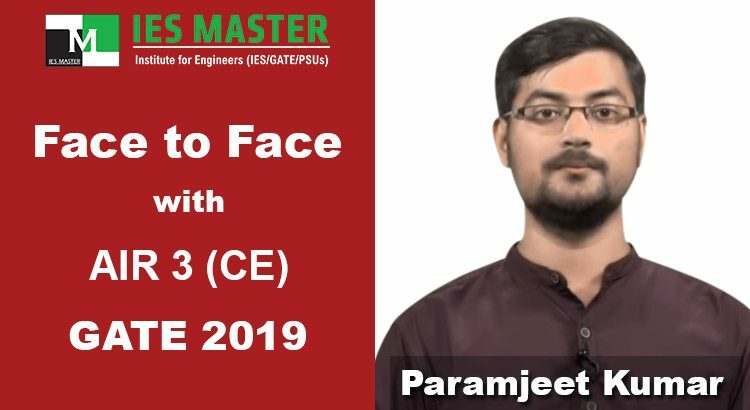 So, I also wanted to crack GATE and ESE and get a good position in PSUs. Your take on IES Master study material? IES Master study material I think is one of the best material available in the market. I suggest that every student should study these materials for their preparation of GATE and ESE. What according to you makes IES Master stand out? The quality of education provided at IES Master by Kanchan sir and other faculties is the best. They make us understand each and every concept in the classroom itself. How was the section 1 in GATE 2019 paper? The Mathematics and Aptitude section of GATE 2019 was quite easy as my set was 1. It was quite normal. I solved all the questions, but I committed mistake in English section of one mark. Overall it was quite easy. The trend was quite different as you can see that in last two-three years, the question level was from moderate to easy. But this year, most of the questions were of moderate to tough category. That’s why most of the students could not score good marks in GATE 2019. What was your preparation strategy? GATE preparation is all about accuracy. If you are accurate, you can score good marks. So, practice is the only key to success. What was your daily study schedule while preparing for GATE 2019? I used to study daily for round six hours in two shifts of three hours each. What was your plan for the D-day, and how you executed it? Reach the examination centre as early as possible, and if possible, visit the centre a day before the examination to determine the time required to reach the centre, and get rid of the fear of missing the exam. According to you, what are the mistakes that students are likely to commit during exams like GATE? The mistake generally committed by students in exams like GATE is that they try to attempt all the questions without solving them accurately. This results in negative marking. So they score low marks in exams like GATE. What would be your message to your juniors from NIT Patna? I would suggest my juniors from NIT Patna that they should join IES Master for a bright career in GATE and ESE. Take us through your journey from your school to NIT Patna. I had a bonding with my school-time friends as I spent seven years there. When I moved out to NIT Patna for graduation, there also I made many friends, and we are still in contact with each other. From where you did your schooling? I had a lot of fun during my schooling days as it was a fully residential school. My school name is Sainik School Nalanda. I was there for seven years i.e. from sixth standard to twelfth standard. Tell us a little about your family? I belong to Buxar district of Bihar. My father is an ex-serviceman. My mother is a housemaker, and my brothers are engineers. One of them is in Hyderabad, and another one is in Mysore. It is wonderful to have you here at IES Master, we are so proud of you. We thank you for your time?